Elegant designed 5-panel giclee print on artist canvas with landscape in Modern style. Availability: Make to order and usually ships after 3 to 4 business days. HD giclee artwork, printed & stretched on museum quality 410 gsm cotton canvas, acid free. Ready to hang, strong wooden inner frame ( 1 full inch ) with tight hand stretching. The image continues around the sides. Edges are staple free (Stapled On The Back). 2 layers of UV-protective satin varnish. Waterproof surface, can be displayed in bathroom and kitchen. Bo Yi utilizes Epson printing process, the best in the industry. 100% satisfied guarantee. Shop with confidence! Canvas Prints are printed with the Canon large format indoor printer on back-lined canvas containing museum quality 410 gsm cotton canvas, acid free. Prints employed are original ( no OEM print is used ) and are water-based, do not contain any carcinogen substance and are offered under a 100-year colour fastness warranty. Canvas Prints are free of any smell and odour. Finished Canvas Prints are hand-stretched on dried wooden frames and coated with varnish to enhance the lustiness of colours and contribute to durability while providing dust protection. We accept customized order request for smaller/larger size, and you may also have your own photographs developed into Canvas Prints. You can immortalize your marriage photos, birthday pictures, photos of your children by getting them developed into Canvas Prints. You can gift them to your beloved and make surprises. We will start processing the order right after receiving clear payment. As soon as the order is ready, we will ship it out from our art store in St Louis, MO ( USA ) in 2 business days. Tracking number will be provided via email. 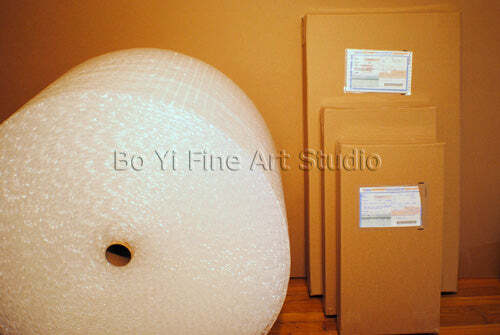 All of our artworks are professionally packed with great care to ensure safe delivery. * For international shipment, the receiver has the responsibility for paying duties and tax of custom. For shipping cost, please check out shipping detail of this item. © 2018 Bo Yi Art All Rights Reserved.